“Behold, what manner of love the Father has bestowed upon us, that we should be called the sons of God!” (1 John 3:1). “Beloved, let us love one another: for love is of God; and everyone who loves is born of God, and knows God; for God is love. How do we know the love of God? Because God sent his only begotten Son into the world, that we might live through Him. Here is Love, not that we loved God, but that He loved us, and sent His Son to be the cure for our sins. Beloved, if God so loved us, we ought also to love one another. No man has seen God at any time. If we love one another, God dwells in us, and His love is perfected in us….We have known and believed the love that God has to us. God is love: and the person who lives in love is living in God, and God in him. How/why is our love perfected? So that we may have boldness in the day of judgment: because as He is, so are we in this world. There is no fear in love, but His perfect love casts out fear; because fear has torment. The person that fears is not made mature in love. We love Him, because He first loved us. If a man says “I love God”, and hates/disregards his brother, he is a liar: for he that loves not his brother whom he has seen, how can he love God whom he has not seen? And this commandment have we from Him: That he who loves God also loves his brother” (1 John 4:7-21). Aberesh is 30-something. 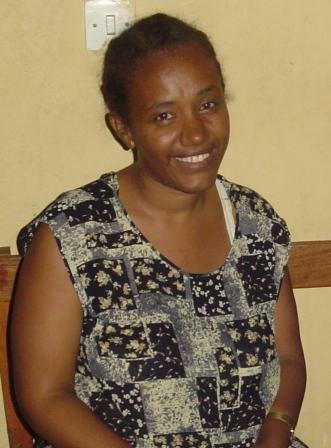 Her name is pronounced “Ah-bear-ish.” It is a common name in Ethiopia. I don’t know what it means. But I know the woman who bears that name. She is a gentle, quiet, godly woman. She speaks softly. She smiles often. There is no look of guile in her countenance. At each of my women’s Bible classes, she is there, with her Bible open, her little notebook, and her pencil. Her eyes are bright as she contemplates the message of the Scriptures. Aberesh is a “seasoned” woman. Life’s trials have had their fruit of righteousness in her. The stubborn self-will that resides in each of us has been tempered. There is a deep pain that reminds her of who she is, and her dependency upon the Saviour. I first met Aberesh up close and personal in December, 2006. We were in Alaba, Ethiopia. We had a full schedule of planned ministry, but God also had His special surprises. One of these was a spontaneous visit from Aberesh. She came to our room with a translator. She had heard that I was a nurse. She struggled with why she was losing her babies. Over and over her babies had died in late pregnancy. Only one had survived birth, and that one was claimed by malaria a few months later. In Ethiopia there is no retirement fund or Social Security; children are your retirement security. There is no long-term care insurance coverage; children will care for you. There is no disability insurance; children will assist you. There are no “labor saving devices” to ease work when aches and pains come; children help you. Without children in Ethiopia, the future looks very bleak. Unlike many in our society, children are considered precious blessings. They are a necessity. They are desired. Most Ethiopian couples want to have many children. Part of this is because of the high likelihood that many of the children will not live to full adulthood. Part of it is the desire to build a big safety net for the future. Part of it is the honor and respect that comes with biological productivity. So here was Aberesh sitting in my room. “Why?” she was asking me. Why does any calamity happen? As we look at the story of the “Good Samaritan” and ask this question, the answer is clear: that God’s glory would shine in the midst of a sin-laden world. Already God’s glory was shining in Aberesh’s calamity. Her spirit was tempered with godliness, a tempering that comes only through trials and tribulations. And now we are looking again for His glory to shine. We are looking to Him to provide a healthy baby. The man in Jesus’ story applied oil and personal nursing care to the Samaritan victim; he used what he had to help this person who had intersected his life along that road. And so, we are using what we have to help this woman of Alaba who has intersected us along Life’s road. In His providence, God has given me a measure of medical knowledge, and a past experience that compared with Aberesh’s. So at our next trip to Alaba (June 2007), I brought her a blood pressure cuff, and I explained very clearly about “toxemia,” “pre-eclampsia,” “pregnancy-induced high blood pressure” – all names for the same phenomena. With this condition, the blood pressure rises quickly to a dangerous level late in pregnancy and endangers the baby and the mother’s life. The expectant mother is usually oblivious to the danger; there are no symptoms until it is too late. I have personally seen young mothers plunged into coma, supported by ventilators, because of this problem. Countless babies have died in utero as their blood supply lapses. It is a very real, very sudden, very dangerous condition. But it may not be a hopeless condition. Long ago someone prayed, “Lord, command anything You want, but also make me able to obey Your command.” I feel this same way about helping Aberesh. Providing a blood pressure cuff, giving instructions, and providing funds for prenatal care was easy. But the real issue is this: how will she get the help she needs at the moment it is needed? You see, usually the “cure” for this condition is an emergency C-Section. Very few hospitals in Ethiopia have the capability of this surgery, and the level of neo-natal intensive care is pretty low. And, generally speaking, Ethiopian doctors are not aggressive in dealing with medical conditions. One day, I sensed the Spirit telling me, Go and be a medical advocate for Aberesh and her baby. As Dave and I prayed over this issue, it became clear that this was one of those “good works” appointed to us (Eph. 2:10). So we began the logistics. And how has our Lord provided the things necessary for this obedience? He has provided funds for the airplane ticket, even though I have retired from working outside the home. And He has given us grace in the eyes of someone living in the capital city. I’ve never met this person. She was referred to me by someone else, who in turn was referred by someone else, etc. The World Wide Web has nothing on God’s network! 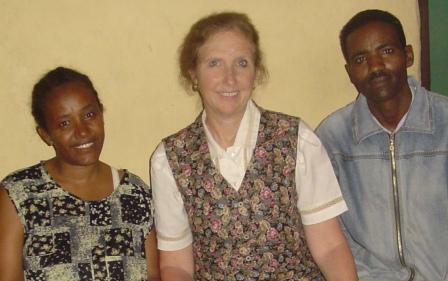 And this person who has opened her home to us just “happens” to be a nurse at probably the most developed hospital in Ethiopia, a Korean Christian hospital. Not only is she a nurse, she is also the Director of the “neo-natal intensive care” unit! To God be the glory! Already, His Hand of provision is evident. As I write this, there remains only a few weeks before the baby will come. Already Aberesh has moved to Addis. I will meet her there on Tuesday evening, January 8. We will stay in the home of this gracious sister in the Lord. I will provide personal medical monitoring of Aberesh and, when the time comes, we will go to the Korean Hospital for her delivery. For the glory of God Himself we are asking Him to provide a healthy baby. I’m asking Him for a boy! Love comes from God; in fact, He is love. He has put His love in us by His Spirit, and His love is always action-oriented. By His appointment, He caused my life to intersect with Aberesh’s, so that Love could flow. And by His appointment, He has caused you to share in this intersection; His love in you is flowing also. Some of you have been praying diligently for Aberesh for weeks or months. Some of you have sent gifts for her. Some have contacted me with ideas and potential remedies for her condition. Some have sent funds to help with her expenses. It is a community of Love that surrounds this woman of Alaba – community arranged by the Father of Love, who modeled Love for us by sending His own Son to help us in our calamity of sin. Whatever good comes from this situation, let us always, always give the credit to the One who deserves it! He authored Love. He modeled Love. He appointed a Love situation. He provided the Love needed for the situation. And we trust Him to bring more glory to Himself as the days and weeks of the future unfold. Only let us be faithful. Let us love!